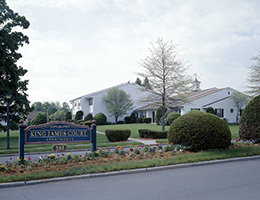 King James Court is a beautifully designed community for senior citizens. There are 120 apartments in a quiet country setting, including 13 specifically designed for handicapped individuals and those with disabilities. With eleven beautifully landscaped acres for you to enjoy, King James Court is within five minutes of shopping areas and churches, and offers demand-response bus service. We have spacious one and two bedroom apartments that include ample parking, a community room, an active tenants association and individual garden spaces. 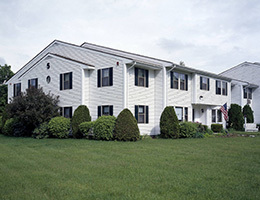 King James Court offers elderly (62 and older) and handicapped persons the opportunity to live in a beautifully landscaped, quiet country setting comfortably and securely and at an affordable rent. There is an onsite Resident Service Coordinator to assist residents with a wide range of services and referral information as well as full time property management, maintenance and grounds crew. 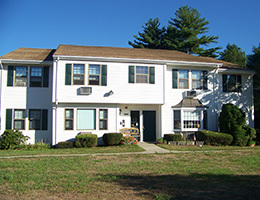 The New England Affordable Housing Management Association has recognized King James Court as a Community of Quality. A Community of Quality is certified as having achieved a high standard of excellence in the way they are managed, the services they provide residents, the experience and training of personnel, and other criteria. King James Court is a smoke-free community and grounds.